It all happened as a result of a broadcast to schools by an eminent professor who explained the physiological effect of muscular energy used against resistance and how a muscle became fatigued as a result of continued pressing and relaxing while in constant contact with resistance. I disagreed with certain of his explanations and proceeded to prove my points by testing my own reaction and the reaction of selected pupils to the fatiguing of certain muscle groups. The broadcast was on a Friday evening and proved me correct. During the next day I found my mind wondering back to theories regarding muscular fatigue as explained by several physiologists, including the broadcaster of the previous day. Now, there are some body-building authorities who insist that a muscle must never be fatigued in body-building, and that exercising should be discontinued when it is felt that three or four further reps could be performed. In the past two years I can rightly claim to have developed among the pupils training at my club some of the finest physical specimens in this country today, including Ken Kerridge, Adrian White, Alan Conway, "Wag" Bennett, Tom French, and a new sensation -- Harry Fussell. 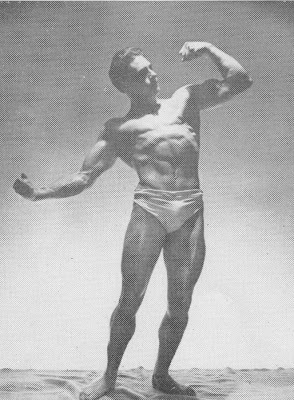 These men are not only good to look at, they are strong; as it is a policy of the club not not only develop shapely muscular physiques, but to develop strength in proportion. One 15-year old youngster (Ken Cooper) recently performed two repetitions on the bent arm pullover with with 220 pounds, a dead lift with 415 pounds and a deep knee bend with 300 pounds. All these men, without exception, squeeze the last possible repetition out of a set, and they have all built their physiques at the Viking club in under two years of training. There are many theorists who would, and do say (turning a blind eye to the results) that I work my pupils too hard, and there are other professional instructors who insist that I drive away certain clients because of this tendency. Be this as it may, I prefer to keep the men who are prepared to work hard and confidently, as I am not out to make a fortune from the ones who are willing to believe they can build a powerful muscular physique without hard work. I have always felt that when performing 10, 15 or 20 reps, it was the last 3 in 10, the last 4 in 15, and the last 5 in 20 that had the greatest value, and that if one could perform those last few reps without the first reps that are normally performed easily, a much quicker result could be obtained. My discussions with physiologists suggest to me that no one really knows what makes a muscle grow. We know, of course, that a muscle grows as a result of exercise, but not what chemical reaction builds muscular tissue or increases the size of muscular fibers. 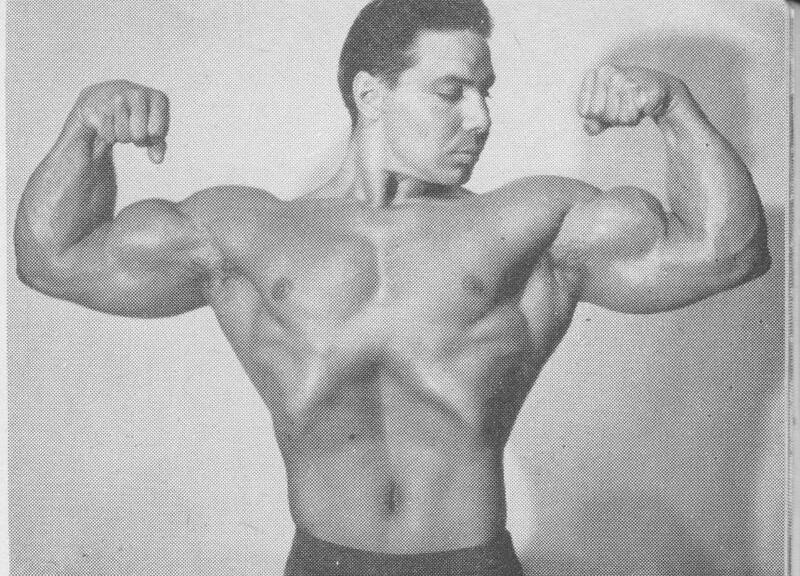 It is fairly well established that the number of muscle fibers never increases -- it is the increase in size of the fibers that develops muscular bulk. One of the leading physiologists in this country recently made a series of tests on developing the muscles of rats. He anesthetized these rats and at regular intervals sent electrical impulses into their systems. This caused muscles to react violently against one another without any movement of the limbs. In a short period of time, approximately one month, the muscular bulk of the rats had increased by a third. This is very interesting because it seems to bear out a theory of the experimenters that muscular tissue is developed by isometric contraction. If this is so, it means that you can develop muscle tissue by attempting to move unliftable weights far beyond your physical capacity. In fact, to develop your biceps muscles, for an example, you can have a bar set into two concrete posts, then simply attempt to curl with the bar fixed in the appropriate central position of a normal curl, and by straining against the weight, develop the muscle. Such a theory as this is difficult for me to believe, but it will be put to the test at some date in the future, and I will inform readers of our findings. Meanwhile I will get back to my explanation of the Multi-Poundage System. As I explained earlier, I believe in using muscles until not another rep can be squeezed out of them. During the conflicting thoughts and theories that flashed through my brain on this Saturday, was a theory that maybe I could incorporate certain ideas of physiologists regarding the building of muscular tissue with my own. "Wag" Bennett had asked if he could train at the club on the Sunday morning following. I had agreed that he could and decided that I would map out a special experimental program of training incorporating my new ideas. These ideas kept me awake most of Saturday night, and on Sunday morning I was so excited and confident of the scheme that i was unable to wait for "Wag" to arrive -- I commenced experiments alone. This saved a certain amount of time, for when my training partner arrived I had decided the commencing poundages for us both on most exercises. We commenced with the press on back with a poundage that we could both normally perform about 7 reps. At the end of 5 reps, and without stopping, one 20 pound plate was removed from each end of the bar, making for a 40-pound reduction in the weight being used. 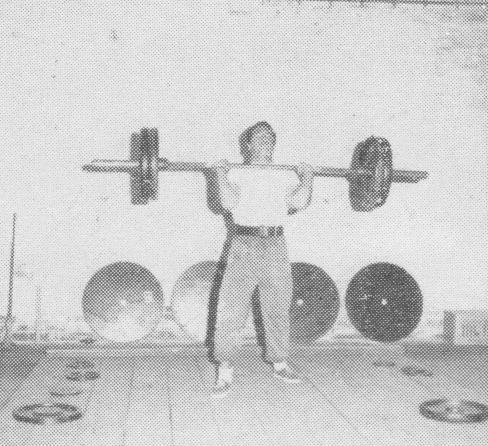 It was then possible to perform another 6 reps. At the end of 5 of these, the weight was again reduced by 40 pounds, and it was found that another 5 or 6 reps could be performed, but with the last 2 reps, although the weight felt very light in the hands, great difficulty was experienced in locking the elbows because of the apparent choking of the muscles with lactic acid. It was discovered that a slightly longer rest than normal was required between sets. At the end of 3 sets the pectoral muscles of the chest and the anterior deltoids really felt as though they had a terrific work-out and were flushed with blood to the extent that they appeared abnormally large. From the press on back we proceeded to the standing curl, and we adopted the same procedure, but owing to somewhat lighter weight being used the reductions were of 30 and 20 pounds. (an approximate 20% reduction between each no-rest set of reps seemed to be ideal.) Again we performed 3 sets of between 12 and 15 total reps and again the muscles were worked as they had never been worked before. No matter what the poundage was for the various reduced reps, it always felt as heavy as the weight used for the previous reps. Consequently, we used what appeared to be a maximum poundage all the time while performing 15 reps.
We then tried a similar test with the pulley-weight machine on latissimus developing. The reaction here was so unusual and the flushing of the muscles so extreme that I felt uncomfortable when trying to place my arms straight down the sides of my body. From the pulleys we switched to the pullovers to arms' length on bench for triceps, performing 3 sets with a similar reaction. The deep knee bend proved the effect to be the same, and for our last exercise we performed the press behind neck seated. This was the toughest of all exercises, and although the weight was reduced by 20% at the end of each 4 reps, great difficulty was experienced in completing 12. The result of the first test of the new method of training was extremely exhilarating and gave us a new zest for bodybuilding. We agreed to plan a schedule and practice it four nights a week for a month to see what sort of result could be obtained. At the time of writing we have completed three weeks with excellent results, but although the muscular gains have been very good, the increases in strength have been remarkable. 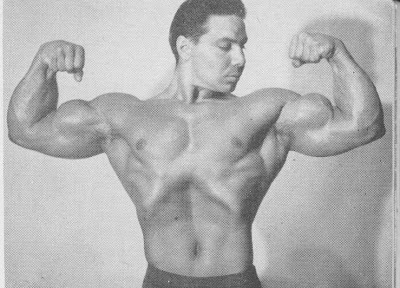 We increased the poundages on the first few reps of the press on back by 50 pounds, in the curl by 40 pounds, in the pullover to arms' length by 40 pounds and in the press behind neck by 30 pounds. I have switched several of my pupils to this method of training on two or three exercises of their schedules. The results obtained are excellent and prove the system is efficient and effective. It will most likely prove too intense for relative newcomers to the weights, but advanced men will find that they will get remarkable results from its practice. It takes an evening or two to get accustomed to knowing just when to reduce the weight -- this should be when it is felt that only one more rep could be squeezed out. The unfortunate part about this system is that on many exercises it is necessary to have one or two training partners working with you. The man training at home on his own would be restricted. Naturally he would have no one to slide the weights off for him. One or two of the lads have overcome this in exercises such as the curl, in which they have lowered the bar to a bench, slipped the discs off quickly, and carried on their reps with very little rest. Using preloaded dumbbells of varying weights would make it possible to put one pair of bells down and pick up another pair immediately. In the press on back one is stymied unless he has someone to assist. Incidentally, I would point out here that it is extremely uncomfortable when handling heavy poundages on the press on back to have one end reduced in weight before the other -- always try to whip them off quickly and together. 3 sets of 4 to 5 exercises are sufficient, and I would not recommend that any more be used.